A wide selection of money clips, perfect for engraving with his initials, name or a monogram. Rhodium plated money clip has a scratch resistant finish. A simple decorative design runs down the outside edge. 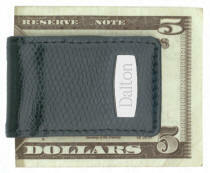 We will personalize this money clip with engraving of your choice - a name, initials, or a monogram. He's sure to love and appreciate a personalized money clip. This gold plated money clip is gift boxed and can be personalized with engraving of a name, initials, or a 3 letter monogram. This gold plated money clip is gift boxed and can be personalized with engraving of a name, initials, or a 3 letter monogram in the center oval. The strong magnets in this black snake skin money clip will keep his bills safe and orderly. The chrome plate at the end of the money clip is perfect for personalization with his name or initials. We engrave in your choice of lettering style to create the perfect personalized money clip he's sure to love. Gift boxed.